Happy Monday Mom’s Test Kitchen readers! Ang here again! This month, instead of a recipe, I’ve got a great DIY gift idea for you; just in time for the Holidays! My readers over at Juggling Act Mama know how much I love making my own beauty products to give as gifts. 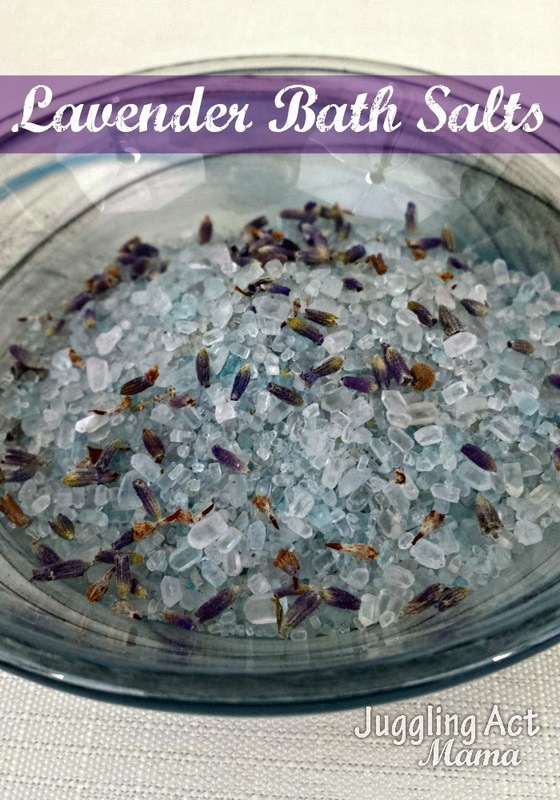 Do you know how easy these bath salts are to make? You can make a whole bunch in a matter of minutes! 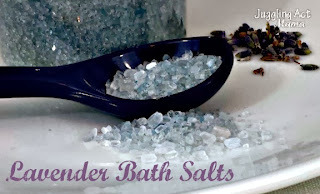 Pretty jars of lavender bath salts make the ideal holiday gift, since they are inexpensive, quick and simple to make. A hot bath with soothing lavender bath salts are a wonderful way to relax and unwind. It’s one of my most favorite ways to enjoy “me” time. The primary ingredient is Epsom salt, which helps to detoxify the body, soothes sore muscles, relieves stress, improves oxygen flow and much more. The second component is the lavender essential oil. Lavender also aids in relief of stress, and is calming. It’s especially good for soothing stiff joints, sore muscles, and headaches. You can see that Epsom salts and Lavender essential oil are a couple of power players when it comes to chilling out! (Note: These jars work great, but any type small 4-oz jar will do. )For each 4-oz jar, you will use 1/2 cup of Epsom Salts, and 10 drops of essential oil. And for extra lavender goodness, add a tablespoon dried lavender to your bath salts. Measure the salts into a mixing bowl, then add the essential oil and stir. Place the funnel in the jar and spoon the salts into the jar. Download these sweet gift tags, add a pretty ribbon and you have a thoughtful handmade gift! Love the look of the bath salt. I’ll pass this recipe to my wife. Maybe she’ll give it a try.